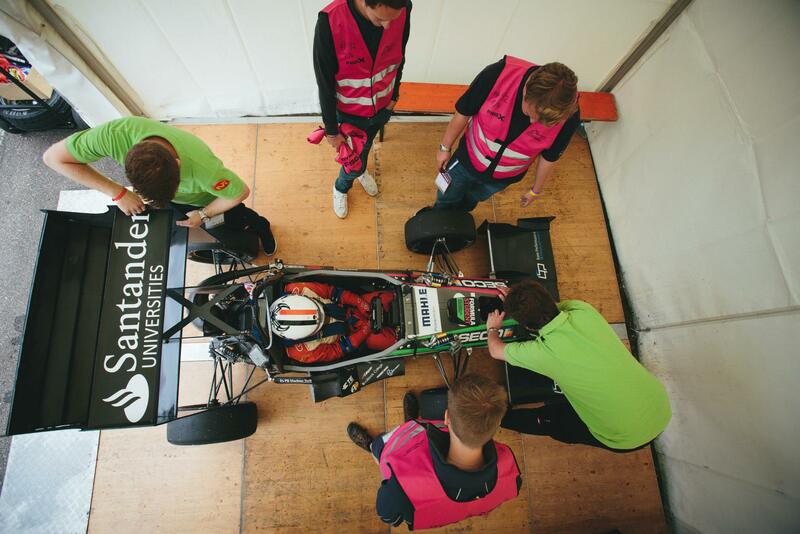 This summer the team competed successfully in three competitions, one at home at Silverstone, and two in Europe, Formula Student Germany and Formula Student Hungary. Our 2015 car, Izzy, performed well and OBR are proud to announce she is the fastest car we have ever made. See below for a summary of our results in 2015! In bold are the results we are particularly proud of. In Silverstone in July, the weekend was a challenge for the team. Being our home competition, our garage was always alive with activity, with visits from sponsors and supports alike. Having won Design the year before in 2014, expectations were high and we attacked the weekend head-on, developing our control systems to produce a solid Acceleration event to start, beating our fellow UK teams. Skidpad provided us with a top 15 result, and results coming in from the Static events were promising also. An 18th in Cost (with a dramatic late boost from provisional to final results) gave the team a well-deserved morale boost and the news that the team had made Design Finals for the second year running was greeted with cheers. FSUK has always treated the team well and 2015 was no exception. The excitement of the weekend fully took hold during our Sprint laps, with the whole team cheering our drivers on, accompanied by many family members and supporters. Nerves set in early on Sunday morning while the team prepared the car for the Endurance event. This is the biggest event of the weekend in Formula Student competitions and being our home competition (only an hour drive from our campus) it was vital we finished the 22km. Drama unfolded as the typical British weather threatened, the dark clouds hovering overhead as Izzy took to the track towards the end of the afternoon. With the team all huddled nervously up on the bank, cheering each time the drivers passed for another lap, we all crossed our fingers and willed Izzy on. The chequered flag waved! We had completed the Endurance event for the second year in a row. The drama was not over yet, and Team Bath, one of our main rivals, finished their own Endurance run just seconds before the heavens opened; the pitlane became a river and everyone rushed to get their cars back to their garages. Through all the excitement and challenge of the weekend, OBR came sixth overall, equalling 2014, and we came away knowing we had a fast car that was reliable and ready to be developed. We headed to Europe! Camping for the first time in a few years, the team excitedly soaked up the atmosphere as we set up in Hockenheim, having brought the rain with us from the UK. We knew FSG would be challenging, providing tough competition from teams all across the world. Scrutineering was one of the toughest few days for the team, with the officials being more precise than ever. Our aerodynamics team united to get the front and rear wings passed, the whole team helping out to get through Technical Inspection. With Statics finished by Thursday, the Dynamics could begin. Determined to make the most of our days in Germany and to ensure the car was as ready as possible, we were one of the last cars on the wet Skidpad track on Friday evening. A great place of 12th proved what we knew: our car was fast. Watching from the grandstands on Saturday, the team waited anxiously as Izzy joined the long queue for the Sprint event, in the late afternoon when the track was hottest. The tension built as the cars slowly moved forwards the clock ticked down to when the event closed… With less than two minutes to go, OBR reached the front of the queue, our engineers nervously waiting for the event officials to wave the green flag. Finally we were allowed on track just as the event closed- hopes and tensions were high as our drivers flew around the course to give us an impressive 7th place. Unfortunately a failure towards the end of the Endurance event put a stopper to our dreams of making the podium at FSG. Still, the team had some much deserved time out at the Mahle Party at the end of the weekend and, all shirts swapped, headed back to the UK to prepare the car for Hungary. With one last push for results in the summer of 2015, the team headed out to Hungary in mid-August. This was a new destination for the team and we were excited to meet new teams and explore new places. We knew the car could be quick. Even before arriving at the track we knew the engine had been causing us a few issues. We decided to remove the car from the pit overnight. Taking the car to a well-lit car park in central Gyor, the powertrain team worked tirelessly through the night to find the source of our issues. It turned out to be the sprag clutch, something we didn’t have with us, returning to the track the team starting to ask around other teams to see if the part could be found. We would like to thank Tu Fast, Szengine and Tu Brno for their amazing help in finding the part. Part found and engine fixed the team prepared for the next few days. Statics went well, with a great 4th place in Cost, proving our car is marketed as one of the truest ‘weekend racer’s on the grid. 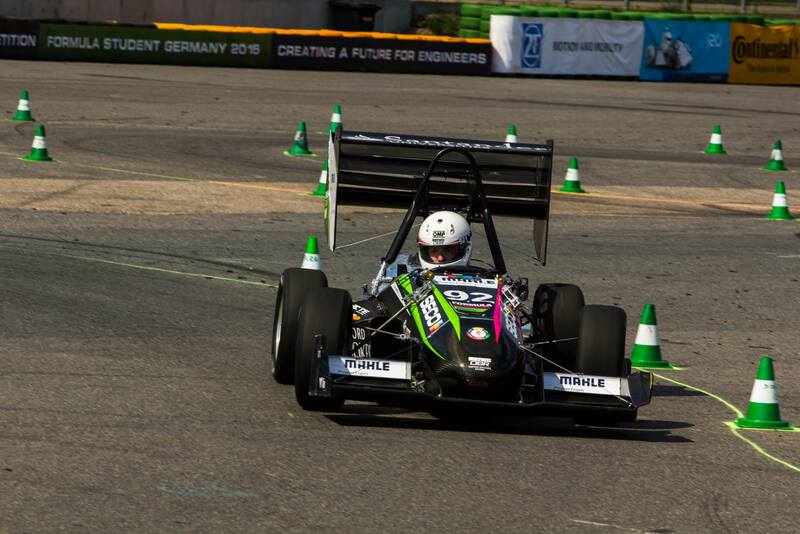 Acceleration and Skidpad again provided us with top 13 times, as the top spot continued to prove elusive. The team worked hard to improve the car for the last effort of the season. However a dramatic suspension failure during our Sprint lap marked an unfortunate end to a great season. The team tried to think of any way to fix Izzy but that was the end of OBR’s competition. The team admitted a gracious defeat and instead enjoyed watching the cars during Endurance on the Sunday before heading back to the UK. 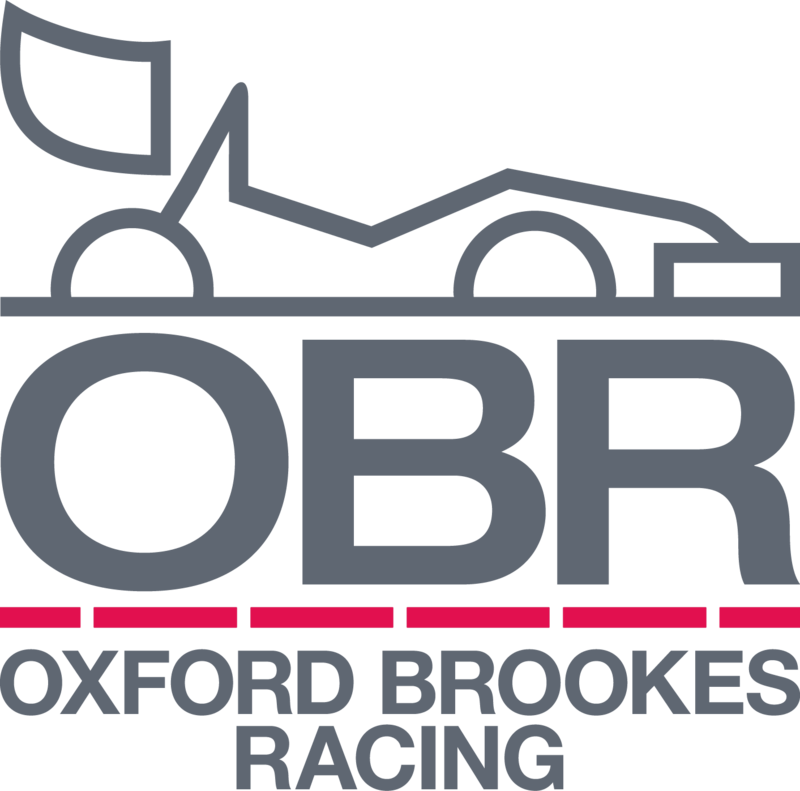 All in all, OBR’s 2015 season has been a great success, coming home with a few trophies and forging new friendships. However 2015 has not been without its challenges and the team strive to learn from mistakes as well as bad luck. 2016 beckons! We would like to give thanks to all our sponsors (see our Partners) for supporting us throughout the year, both through our successes and challenges. Thank you to Oxford Brookes and our MEMS department for seeing us through and giving us fantastic opportunities, including our glamorous Launch Party. Formula Student wouldn’t be the great competition it is today without the brilliant cooperation and friendships between teams. As we try to offer our help to other teams in need, we are grateful for the support when we struggle. We would like to thank Team Bath Racing, Tu Fast, Szengine and Tu Brno for your assistance over all three competitions. Looking forward to seeing you again on track next year! Previous postGearing up for FSUK!